Description: The discovery by Bedouin of ancient scrolls in caves near the Dead Sea in 1947 led to scholastic and popular excitement that continues to the present day. This volume will assist text scholars and archaeologists alike, as well as readers from other disciplines, and the interested public, in approaching a better understanding of the ancient texts of Qumran and the site where these texts were found. 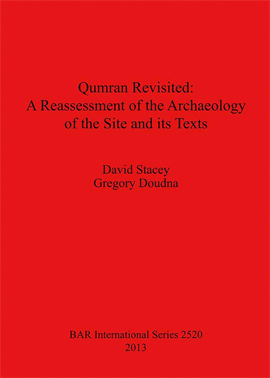 Citation: Ian Werrett, review of David Stacey and Gregory Doudna, Qumran Revisted: A Reassessment of the Archaeology of the Site and Its Texts, Review of Biblical Literature [http://www.bookreviews.org] (2015). Citation: James H. Charlesworth, review of David Stacey and Gregory Doudna, Qumran Revisted: A Reassessment of the Archaeology of the Site and Its Texts, Review of Biblical Literature [http://www.bookreviews.org] (2015).